Whether you need major engine repair or regular maintenance, you can count on Fleetline to get the job done right and fast. 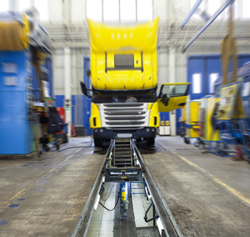 We provide excellent truck care services to Lexington, KY and the surrounding areas within a 50 mile radius. Fleetline is easily accessible from the interstate and New Circle Road. We also offer high quality truck parts like Interstate batteries, Jasper engines and transmissions, Bendix Brakes, Eaton Clutches, and WIX filters. When your truck or trailer needs parts or repair, choose Fleetline for the best service, quick turnaround times, and competitive rates. For more information about our services for industrial, commercial, and fleet vehicles, call us today. Copyright © Fleetline, 2013. All rights reserved. Service calls available 24/7. For after hours service calls please call (859) 797-2251.